Goddess Tara, The Mother of Swift Liberation | Sana Ako si Ricky Lee! So far, all the Buddhas and Bodhisattvas I’ve written about here are Buddhas and Bodhisattvas that are recognized both in Tibetan Buddhism and Chinese Buddhism. However, now, allow me to introduce to you one of the most powerful Goddess in Tibetan Buddhism that is not highly recognized in Chinese Buddhism. I’m talking about Goddess Tara! I don’t really know why is it when Buddhism was first brought to China; the belief in Tara was never really embraced. Theoretically speaking, Goddess Tara is older than Kuan Yin in the sense that Goddess Tara has existed in India and Tibet before Buddhism was introduced in China. Of course, to clarify, this is only true in the sense that Kuan Yin who in reality is Avalokitesvara really started in China. However, if you look at Kuan Yin as Avalokitesvara, which should be the case, then Kuan Yin is older than Goddess Tara. To understand better what I’m talking about here please read my earlier post called – UNDERSTANDING MERCY AND COMPASSION: THE TRANSFORMATION OF AVALOKITESVARA TO KUAN YIN. Goddess Tara is a very powerful Goddess or Buddhist Deity. She is often called ‘The Swift Liberator’, ‘The Mother of Swift Liberation’, ‘The Goddess of Mercy and Action’, ‘The Goddess Who Saves’. This is because Goddess Tara has always been swift in liberating the people who ‘go’ to her in any kind of problems. She’s also called as ‘The Goddess Who Saves’ because she is sure to save people who are in trouble. There are different manifestations of the Goddess Tara, which I’ll be writing about in the future. Tara means ‘Star’ or ‘She who ferries’. This means Goddess Tara helps acts as a focal point that guides us in our lives to choose the ‘right direction’. If you’re unsure of what to do or if you have to choose from 2 different decisions, asking Goddess Tara’s help will direct you to the better path. Goddess Tara is also called as the ‘Goddess Who Saves’ because in Buddhism it is said that Goddess Tara has committed us from the Eight Great Terrors. The 8 Great Terrors in modern times refers to any kind of spiritual and physical danger. The Goddess Tara is also known as the Swift Liberator because it is said that if you need something that’s urgent, Goddess Tara is the one who can swiftly help us. 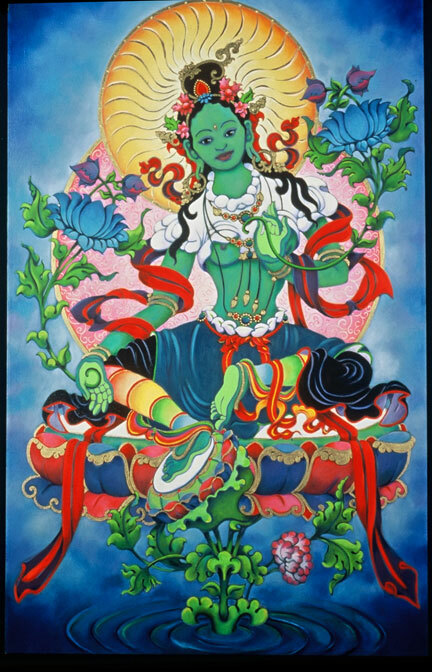 The other name for Goddess Tara is Green Tara because she is usually pictured as a green – colored Deity. She is usually portrayed as a young woman; some say she is a 16-year-old woman, clad in silk. For me, Goddess Tara’s energy is very lively and she’s quick to response. Goddess Tara holds a blue lotus called an Uptula in her right hand, her hand is in the vitarka or teaching mudra. One of her legs is seen dangling, which signifies that she is quick to respond. The story on how Goddess Tara came into being is in itself strong and powerful. It also accurately describes Goddess Tara. It is said that one day, Avalokitesvara, the original male form of Kuan Yin, was looking into the world with his infinite compassionate heart. He saw people suffering from old age. He saw the pain of those who are sick and those who are facing death. He saw the pain of those who are in need of material things and physical sustenance. He saw the hardship of people who wants to attain enlightenment. He saw the desire of the people to achieve happiness but instead because of ignorance gain more hardships and sufferings. Avalokitesvara recognized his vast amount of energy to help this people, but he also saw that the number of people who are in need of his help is even greater. Because of this he was filled compassion and began to weep. Out of his tears, a celestial lake was created, and from this lake arose Tara. She was created out of Avalokitesvara’s compassion and magical tears. She was created to help us. Initially, I wanted to call this post – MY LIBERATOR, THE GODDESS TARA, because that’s how I truly feel about her. The first time I heard and came across Goddess Tara, I already felt an instant affinity towards her. I immediately have a deep reverence towards her. Nevertheless, I felt her infinite power at a time when I have to decide whether to continue work at the PR firm that I worked for or just to leave and join our family business. Deep in my heart I really know that it’s time for me to leave the company that I’m working for. While I was trusted and given the liberty to run a business unit that is worth three million pesos a month, my boss is also making life hard for me. She is a very ‘envious’ woman. She gets jealous if we ran into clients, and because she don’t see them, they naturally would say ‘Hi’ to me first before acknowledging her. She would question me as to why the clients would greet me first and acknowledge her after. Furthermore, I also felt I was not properly being compensated. To makes things worst my nephew thought that I only go home on weekends! He had this impression because he doesn’t see me come home, and he doesn’t see me leave the house. I was so busy that I’d go home at around 11PM or 12MN and leave around 6AM. It felt like I was a boarder in our house. I also notice that slowly my family has stopped inviting me to dinner because they felt that I wouldn’t be able to make it anyway. The worst is I don’t like my boss. I don’t like how she treats her employees, her clients, and even the media who really is the lifeline of her business. She feels that everybody can be bought with money or with designer bags or clothes or trips abroad! In fact, to this day I still have recordings for her saying nasty things against our clients and the media! I love my job but I know I have to leave. But, what do I do after I leave? Will I be happy to if I join our family business? Reviewed by luck pillar for that year and showed something big is about to happen in about 2 months time…something good. But what is that? I also know that there is the holy trinity of luck – Heaven, Mankind, and Earth. The indication of the Heaven’s Luck is something big and good is about to happen but what if I make a mistake and ruined that luck. I prayed to Goddess Tara and she put everything in order. She gave me the courage and a reason to resign. That’s the easiest part. What about what should I do next? I resigned without being sure what to do next; I just trust that my Bazi is right, and that I’ll supplement everything with proper Earth Luck, which is Feng Shui. But Goddess Tara again made sure that my ‘liberation’ would be perfect. I was already thinking of joining our family business, when I started getting calls from clients from my previous employers. They all basically said the same thing, they are resigning and terminating the contract with my previous employer and they hope that I can still work with them. I told them I’m planning to join my sister with our family business, and they all again more or less responded the same manner. They all said that whether I choose to work with them or not, they’ll be resigning their PR agency, my former employer. They also added that they hope they can still work with me, if not, can I recommend another PR for them. I realized that this just might be the thing for me. Maybe this is my next stage! I did an oracle, both inquiring with Kuan Yin and Goddess Tara whether I should just put up my own marketing and PR consultancy company. Both oracles showed an affirmation. Without looking for clients, I actually have 5 accounts already, and they’re all from my previous employer. But then I felt it was quite unethical for me to sign on the accounts from my previous company, but they all reiterated that whether I decide to continue to work with them or not, they’ll resign and terminate my previous employer. To bridge the desire to work with them and the guilty feeling of taking on these accounts barely 2 weeks after I’ve resigned, I told them that I would only be willing to consider once they’ve resigned and terminated the contract with my previous employer. They did just that! It certainly feels like that everything is being laid out in front of me. I don’t really have to pursue anything. I just have to take on the opportunity or not! Another thing that really helped me decide is when I found out that my former boss is bad mouthing me with the said clients. She even went as far as concocting an outrageous lie. But she further dig her own grave when one time she, thru sms, was bad mouthing me with a client saying that she was just on the phone with me and that I said this and that. Little did she know that at that time I was having a late lunch with a said client. The same time she said that I was just on the phone with her. If I was on the phone the client would have known and heard because I never left her side for about 2 hours. When I found out what she was doing, I realized that while I should be forever grateful of all the things that I learned from her. But I should not feel bad about leaving her! Goddess Tara made sure that my liberation will be swift and she provided me with an opportunity to do what I really love to do. 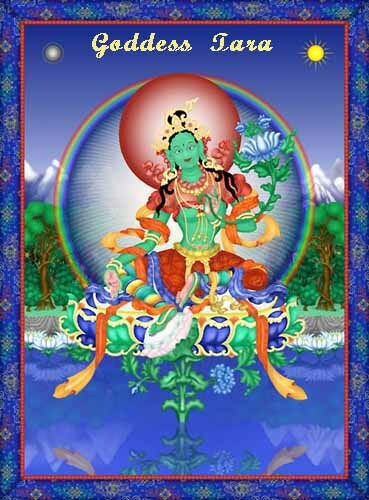 what are the Green Tara offering so she can help you and to also make her happy? You can read my post Paying Homage to Goddess Tara. i randomly came across your site while researching on goddesses of Tibet. strangely enough my career story is very much similar to yours.have no regrets leaving my earlier job, as im happier and have my peace of mind and most importantly have time for my family.at the moment i’m faced with some trouble with a person known to me energetically harming my family and friends and i was seeking for higher guidance and protection and it got me here.i truly agree with how you felt about goddess Tara as i felt awed and embraced by her energy too.i simply want to thank you for posting all the this information!hopefully i too will find answers to my concerns.i wish you well and hope you find all that you seek! In Mahayanna, Tara is a Bodhisattva. In Tibetan buddhism, she’s a buddha. In neither case is she a goddess. She is also a Bodhisattva in Tibetan Buddhism.